Doctor Who celebrated its 20th anniversary in 1983, so it’s quite understandable that it would have been dipping heavily into past continuity. Arc of Infinity is a case in point – we return to Gallifrey and the Doctor is menaced again by Omega, who last encountered the Doctor ten years earlier. Quite how many people had been eagerly awaiting a rematch between the Doctor and Omega for all those years is debatable. True, The Three Doctors had been repeated in 1981, so Omega wouldn’t have been totally unfamiliar to its current audience, but he’s maybe not the most obvious baddy to bring back. The return to Gallifrey promised much, but alas it’s not very impressive. I think their over-reliance on soft furnishings is the problem. Obviously, Time Lords need to sit down (although it’s difficult to imagine the Time Lords from The War Games ever relaxing in a comfy chair) but Gallifrey should be a little more imposing. We meet another Borusa, but Leonard Sachs doesn’t match the performances of either Angus Mackay or John Arnatt. It’s not Sachs’ fault – he was a fine actor, but his timing and delivery (due to age) was just a little off. Much better was Michael Gough as Hedin. The story tries to halfheartedly hide the identity of the traitor helping Omega, but it’s so obviously Hedin that you wonder why they bothered. Perhaps Gough would have made a better Borusa and Sachs could have played Hedin? Colin Baker (and his impressive helmet) makes his Doctor Who debut here. You’d be hard pressed, watching this story, to predict that he’d be playing the Doctor in a year or so, obviously he must have been much more entertaining off-screen, since Maxil is a fairly thankless role. With Tegan apparently absent, this leaves more of a chance to develop the relationship between the Doctor and Nyssa. 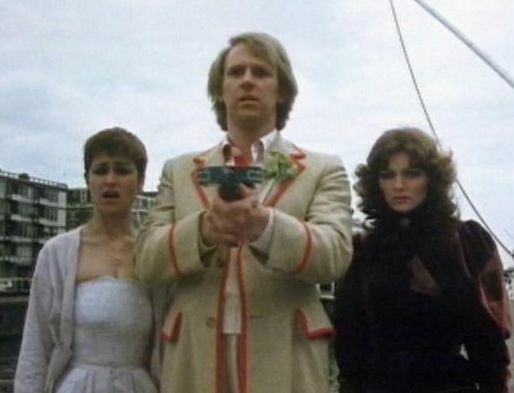 Peter Davison has never made any secret of the fact that he would have been happy with Nyssa as his sole companion – and in the early part of this story you can see how that would have worked. Tegan’s about though, and she follows her cousin by getting nobbled by Omega’s pet Ergon. The Ergon looks silly in the publicity stills and even sillier when moving. 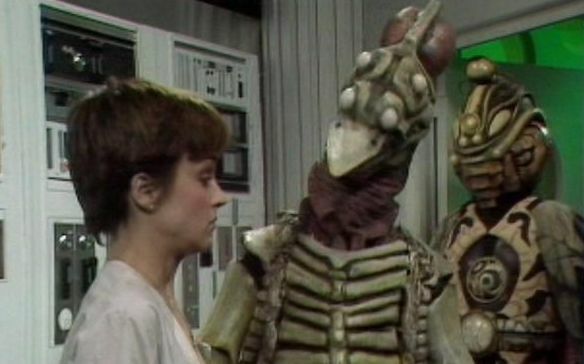 The fight between the Doctor and the Ergon in episode four is fairly jaw-dropping. 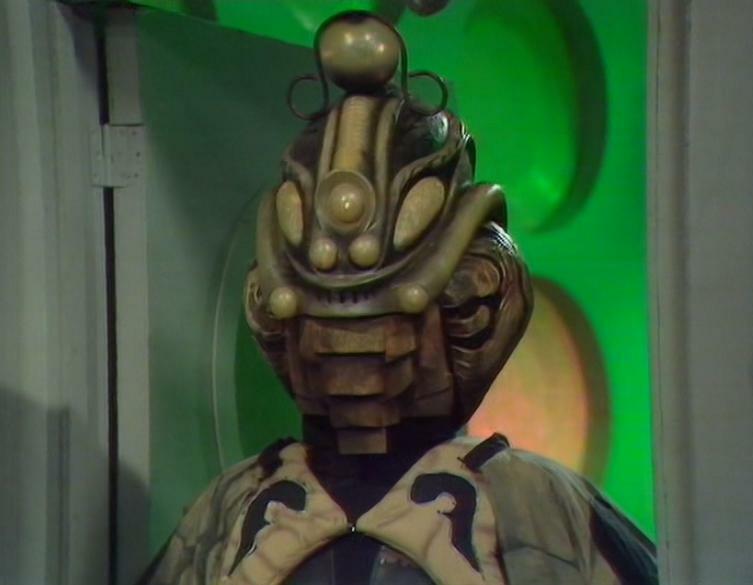 Stephen Thorne didn’t return to play Omega, instead it was Ian Collier. Although I have a lot of respect for Thorne (and his audiobook reading of The Myth Makers should be in everyone’s collection) his Doctor Who villains did tend to SHOUT a lot, so I’ve got no problem with Collier’s more restrained performance. That’s once you’ve got over the mental Image that it’s Stuart Hyde inside Omega’s costume. So we have the return of an old enemy and we’re back on Gallifrey, but the story just feels rather dull and uninteresting. It’s not really bad, just a little bland. As I’ve said, there’s no mystery about the identity of the traitor and although the Doctor’s been sentenced to death, it’s very hard to make this work in story terms. It’s incredibly obvious that the Doctor isn’t going to die, so even when he’s apparently executed we know he’s alright really. There’s the prospect of overseas location filming to give the story a lift though and I love the initial shot, mainly for the fact that we hear an organ playing “Tulips from Amsterdam” in the background, just in case we didn’t twig where we were! Amsterdam is heavily featured in the final episode when the Doctor and his friends pursue Omega through the streets. There’s some nice touches here, particularly when Omega is seen enjoying the sights and sounds of the city. Hedin was certain that Omega only wanted to return to our universe so he could live in peace. The Doctor believes that Omega is mad and would threaten Gallifrey, but who is right? As the Doctor destroys Omega it’s hard not to feel sorry for him. There should have been another way. Solid, but unspectacular, there’s nothing particularly wrong with this story but nothing that noteworthy either. Much better was just around the corner though.